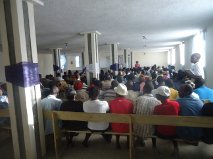 In order to ensure that donated money reaches the beneficiaries and that community projects are sustainable, CEN will assist the 21 localities in Petion-Ville in creating committees that will be in charge of identifing priorities and playing the role of monitoring and evaluation to ensure effectiveness and sustainability. To make that happen, the local catholic church has donated work space to meet and train community leaders. Prepare periodic project reports and share with the Community in an open forum. Provide tools to the committee to help promote the vision of CEN (fliers, posters; shirts , etc.) and training sessions tailored to the needs of specific communities.